2009, Rapidograph pen on cold press illustration board (20 X 20 inches). Yeah, this drawing took a while for sure! This drawing will be a part of Energy Art Movement International Group Exhibition at Sunrise Gallery in Hamilton, Ontario, CANADA from 2009, 11 July - August. This drawing was included in "Imagine the Imagination: New Visions of Surrealism" published by NEgoist Publishing Co., Poland. The book includes works by 100 artists from around the world. 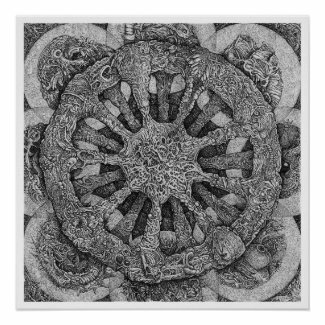 I have prints of this drawing available for sale at Fine Arts America and posters on my zazzle web site. Click the image below for zazzle purchase information.